He could be right, but I would not expect it. Beto O’Rourke has ruled out another run for the Senate, and as he edges closer to a bid for president, Texas Democrats are still searching for someone to challenge Sen. John Cornyn. But Cornyn isn’t convinced O’Rourke has given up his Senate aspirations. Cornyn is correct that no matter what Beto (or Julian, for that matter) says now, there’s a lot of time between now and December 9, and a lot of people running for President. Some number of them may very well not make it to the starting line, and if so they could easily jump into another race like this. 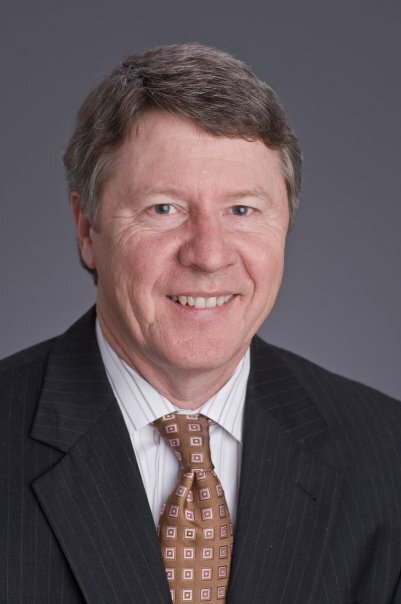 Bill White was running for Senate, in anticipation of Kay Bailey Hutchison stepping down to run for Governor, for quite some time in 2009 before he finally figured out that KBH was staying put. Only then did he shift gears to run for Governor. It could happen. I don’t think it will because I don’t think anyone who has the capability of raising money and building a team is going to drop out before the first votes are cast, and that won’t happen till after the filing deadline. But I could be wrong. Cornyn is not wrong to tout the possibility – I figure Beto is at least as big a boogeyman among Republican campaign donors as Nancy Pelosi. May as well ride that horse till it drops. Senate Minority Leader Chuck Schumer, the top Democrat in the Senate, had urged O’Rourke to run against Cornyn. After O’Rourke decided against it, Schumer met with Hegar, who lost to Rep. John Carter, R-Round Rock, by about 8,000 votes out of 281,000. Nearly 3 million people have viewed a 3-minute campaign video that Hegar, a decorated Air Force helicopter pilot, used in her effort to unseat Carter. But Rep. Cheri Bustos of Illinois, chairwoman of the Democratic Congressional Campaign Committee — the party’s House campaign arm — is urging Hegar to run against Carter, The Hill reported Wednesday. Bustos also said that Gina Ortiz Jones, an Iraq War veteran, will take a second shot at Rep. Will Hurd, R-San Antonio. “I would say over the next, you know, one, two, three cycles, that that state’s going to look very different,” Bustos said. Seems clear that what the national Dems want is Beto for Senate, and basically all of the 2018 Congressional candidates – CD24 not included – back for another go at it. Second choice is Joaquin for Senate and the rest as above. We need to know what Beto is doing before we can know what Joaquin is doing, and the rest follows from that. That’s another reason why I think it’s either/or for Beto – once he’s all in for President (or for not running at all), he will no longer have a clear pathway to the nomination for Senate. Someone else will be in that lane, and the surest way to evaporate one’s good will among the party faithful is to be a Beto-come-lately into a race where a perfectly fine candidate that some number of people will already be fiercely loyal to already exists. As someone once said, it’s now or never. “I am mad. Mad at the avoidable losses wreaked across Texas by the Beto Wave of straight-ticket votes. That straight-ticket wave turned Fort Bend County Democrat, defeated Republicans on appellate courts across Texas, elected Democrats across the state to Congress and the Legislature, and swept every countywide vote in Harris County. 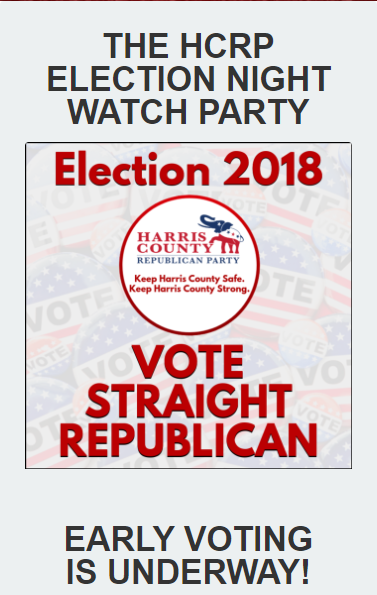 Despite the largest and most ambitious campaign the Harris County Republican Party has ever run, we fell woefully short. “Sadly, this straight-ticket Beto Wave was once avoidable. Texas is one of only eight states that still have straight-ticket voting. In 2017, other grassroots conservatives and I championed legislation to end straight ticket voting in Texas once and for all. But, to the detriment of Republicans across Texas, straight-ticket voting was left in place for one last election–in 2018. This year, faced with the longest ballot in the country, 75% of the 1.2 million Harris County voters (presidential-year-level turnout) punched the straight-ticket option: 500K Democrat vs. 400K Republican, giving Democrats a 100,000-vote margin, with Beto O’Rourke winning Harris County by 200,000 votes. “The result was a down-ballot sweep that would not have happened without straight-ticket voting. May I suggest, before we go any further, that you now click this link? I’ll wait. So, yeah. You know, I’m old enough to remember the year 2010, when two thirds of all voters cast a straight-ticket ballot, giving the Republicans a 50,000-vote advantage before anything else was counted. Funny how that only became a problem to fear when there started to be more Democrats in the county. Clearly, we need to build a wall around the entire state. Maybe we can make California pay for it. As for the thesis that the wingnuts will perform some strategic moderation, let’s just say that the evidence for that is thin so far. I mean, look, we may well lose some amount of the ground we gained this year in the 2020 election. Lord knows, I was feeling pretty damn giddy around this time in 2008 as well, and we know what happened next. But damn, I’m gonna enjoy this for now. Campos has more. 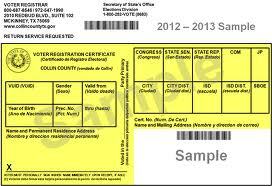 “Study the long November 6, 2018 Election ballot to ensure you make the right choices when voting,” said Harris County Clerk Stan Stanart, encouraging voters to visit www.HarrisVotes.com and select “Find your Poll and Ballot” to review their personal sample ballot before heading to the nearest early voting location to vote. 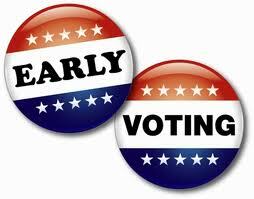 The Early Voting Period for the 2018 midterm election in Texas begins Oct. 22 and runs until Nov. 2. “Most voters will see approximately ninety races on their ballot in which they may choose to vote,” informed Stanart, the chief election official of the county. Of the contests on the ballot, approximately fifteen percent are statewide, seventy-nine percent are countywide and six percent are district contests. In all, over seventy percent of the contests appearing on some voters’ midterm election ballot are for judicial positions. For more voting information, a complete early voting schedule, or a list of acceptable forms of identification to vote at the polls, voters may visit www.HarrisVotes.com or call the Harris County Clerk’s office at 713.755.6965. 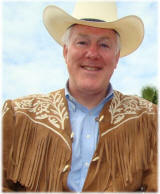 Stan Stanart is Clerk, Recorder and the Chief Elections Officer of the third largest county in the United States. Daily EV totals from 2014 are here, and daily EV totals from 2010 are here. Those 2010 numbers should serve as a reminder that just because turnout is high, doesn’t mean it’s good news for Democrats. As should be obvious, it’s about who turns out, especially in an election where more people don’t show up than do. Early votes were 55.1% of the total in 2014, 56.0% of the total in 2010, and 32.4% of the total in 2006. My guess is that early voting will exceed 60% of the total this year, but that’s just my guess. I’ll be keeping tabs on the daily numbers as they come in. When are you planning to vote? Good story on Lina Hidalgo. First-time candidate Lina Hidalgo hopes Harris County voters frustrated with what she says is poor leadership on flood control and criminal justice reform will help her defeat longtime County Judge Ed Emmett. Hidalgo, 27, is the Democratic nominee for the county’s top executive position. She is one of a record number of Hispanic candidates in Harris County this year, and would be the first woman and Latina county judge. Democrats are betting high turnout among their voters, which helped defeat a Republican sheriff and district attorney in 2016, will overcome Emmett’s broad popularity with residents. “What I have is the moral compass to ensure we are putting the community’s interests ahead of the next election,” Hidalgo said in an interview at her Galleria campaign headquarters. Even in a year where Democrats are motivated by a viable Senate candidate and united in anger against an unpopular president, Hidalgo faces a tough task. She is running against possibly the most popular local figure who did not win the World Series last year. 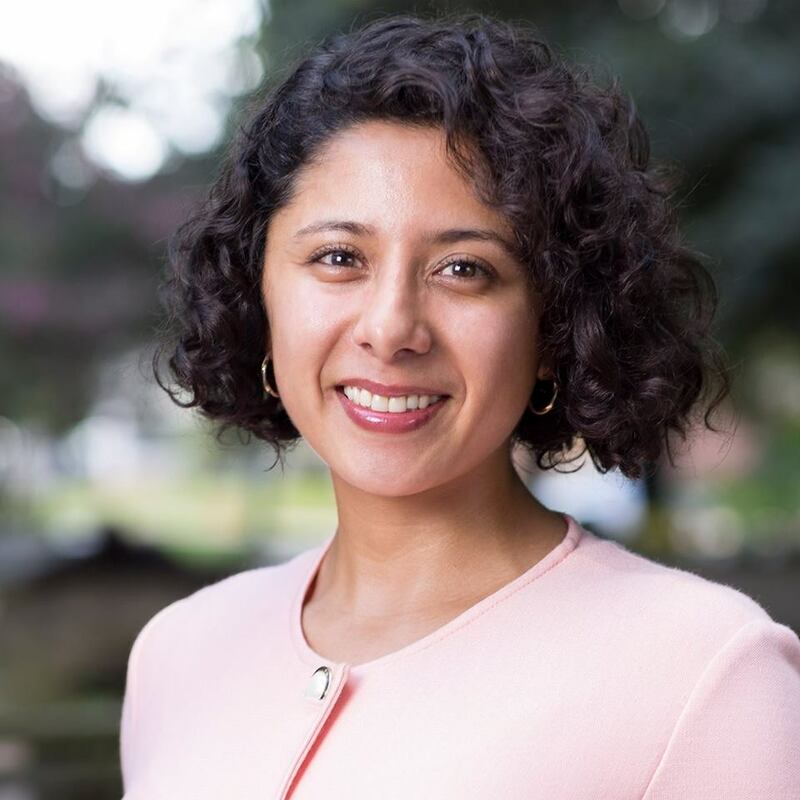 Though Emmett has more experience, is far more well known and has raised more money than Hidalgo, election researchers say she has a path to victory if too many Democrats forget to vote for him. Hidalgo’s background is similar to those of the one-quarter of Harris County residents who are immigrants. She was born in Colombia in 1991, during that country’s war with drug cartels, and moved with her parents and younger brother first to Mexico, and then to Houston in 2005. She graduated from Seven Lakes High School in Katy ISD in 2009, and earned a political science degree from Stanford University four years later. She enrolled in 2015 in a joint master’s program at Harvard University and law program at New York University. As part of her studies she has interned with the public defender’s office in New Orleans and an inmate mental health project in New York City. Back in Houston, she spent two summers at Ben Taub Hospital translating for Spanish-speaking patients. Putsata Reang, her supervisor during a research project in Thailand studying free speech rights in Southeast Asian countries, described her as a hard worker eager to take initiative. “She’s like this incredible force where we were getting 10 employees out of one because of the sheer workload she could handle,” Reang said. Go read the rest, then take a look at the companion piece on Judge Emmett. If there is a nightmare keeping Harris County Judge Ed Emmett awake at night, it may go like this: It starts months before November, when Democrats tell pollsters they, of course, will vote for Emmett, even though he’s a Republican. They like how he led the county during Hurricane Harvey, and the storms before that, stretching back to Ike a decade ago. Election Day arrives. A surge of Democrats turn out, motivated by anger with Republicans at the top of the ticket and President Donald Trump, who is absent from the ballot. They have no quarrel with Emmett. But the lines are long, the ballot is long, and the county judge’s race is below dozens of state and federal contests. At the top of the ballot, however, voters can select the straight ticket of their party with one button. Democrats pick theirs, and leave. And Emmett loses to a 27-year-old who never has held political office. That is the scenario, in the last Texas election with straight-ticket voting, election researchers say could sweep Emmett out of office. Though Emmett is likely to win a third full term, they said in an election in which Republican voters likely will be a minority, the judge should be reminding Democrats to buck their party and stick with him. Stein said his research shows Emmett winning re-election, but with only around 55 percent of the vote — despite being viewed positively by 70 to 80 percent of the electorate. University of Houston political science Professor Brandon Rottinghaus said Emmett, though popular, could become collateral damage in a backlash against the Republican Party. You should read the rest of this one as well, but let me push back a little on the math here. In 2014, the undervote rate in the dozens of contested judicial elections was consistently right around four percent. That amounted to roughly 30,000 votes in each of those races, and in every case that total number of non-votes was smaller than the margin of victory, in race where the victorious Republican candidate mostly drew between 53 and 55 percent. Going farther down the ballot, in the non-judicial countywide contests that appeared after Emmett, the undervote in the races for District Clerk was 4.09%, for County Clerk was 3.90%, and for County Treasurer was 3.46%. I feel like if people remembered to vote for Stan Stanart and Orlando Sanchez, they’d probably not forget to vote for Ed Emmett. As for the estimated share of the vote Emmett might get, we can’t really look at 2014 because he didn’t have a Democratic opponent. In 2010, when most Republican judicial candidates were getting between 55 and 57 percent of the vote, Emmett received 60.6%, so he ran between four and six points better than his partymates. I think 55 is on the high end of the spectrum for Emmett this year, but it’s plausible. The real question I have is, what do you think the baseline percentage for Republicans elsewhere will be? I fully expect Emmett to exceed the baseline, as he has done in the past, but he can’t completely defy gravity. He’s going to need the Republican base vote to be there as well, and if it isn’t then he’ll be in trouble. My interview with Lina Hidalgo is here if you haven’t already listened to it. I think we can all acknowledge that Ed Emmett has been a good County Judge while at the same time recognizing that there are things we could be doing differently, priorities we could choose to elevate or diminish, and causes we could support or oppose with more vigor. Campos has more. Harris County added more than 11,000 voters to its rolls in the final week before the registration deadline, the last wave in a surge of half a million new Texas voters since the March primaries. Democrats are most likely to benefit from the increase because new voters, many of whom are young and/or nonwhite, are more likely to support their party, University of Houston political science Professor Brandon Rottinhaus said. More than 66,000 residents registered to vote in Harris County since the spring, more than any other Texas county, according to the Texas Secretary of State. Since the 2014 midterms, Harris County has added 280,000 voters. Rottinhaus cautioned that there is a poor correlation between voter registration and turnout. Even as more eligible Harris County voters have registered since the 1990s, turnout has declined. Republicans, he said, are hampered by their past success since they already have registered most of their potential voters. Democrats have more room to grow, he said, especially with Latinos, African Americans, new citizens and young people. See here and here for some background. I’m sure what was intended in that last paragraph was that while overall turnout has gone up, at least in all of the Presidential year elections in the county, the percentage of turnout of registered voters has declined. Far more people voted in Harris County in 2016 than in 2008, for example, but the rate of turnout was slightly lower, precisely because there were so many more registrations. Anyway. 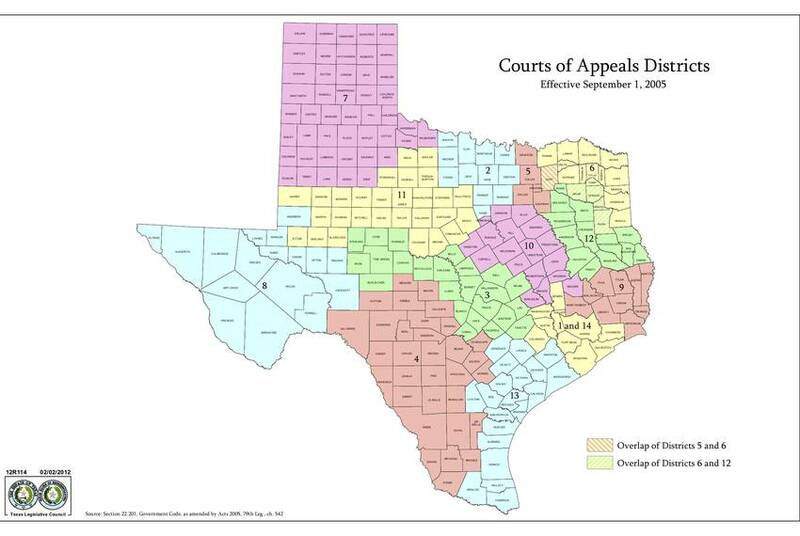 Putting the numbers together, we’re at 15.8 million statewide, and around 2,316,000 in Harris County. Keep that latter number in mind when you read this. One million voters in the county would be a lot for an off year – a record amount, in fact – but it would still only represent about 43% turnout. The high water mark so far is 2010, with just under 800K voters, and 41.7% turnout. Can we beat that? It feels a little crazy to say so, but I think we can. I also think we’d have a very different electorate with that one million this year than we did with that 800K eight years ago. I think we’re headed for new heights statewide, too. It’s on us to make sure the mix of voters is what we want it to be. And they’re breaking the minds of Ted Cruz supporters. The conversation unfolding before a campaign event for U.S. Sen. Ted Cruz here last week echoed similar ones popping up among Republican groups around Texas. With a mixture of frustration and bewilderment, attendees were discussing the proliferation of black-and-white yard signs in their neighborhoods brandishing a single four-letter-word: BETO. The signs have become a signature calling card of Democrat Beto O’Rourke’s bid to unseat Cruz. While Democrats posting yard signs for candidates is nothing new, even when it happens in some of Texas’ most conservative conclaves, what’s been different this summer is the extent to which O’Rourke’s signs have seemingly dominated the landscape in some neighborhoods. Meanwhile, Cruz signs are far tougher to spot, and many Cruz supporters have become increasingly agitated at their inability to obtain signs to counter what they see on their daily drives. The difference in tactics goes back to a 2006 political science experiment. At the time, former Gov. Rick Perry was running for his second full term and allowed for researchers to try different tactics in some communities to test which were most effective at motivating voters. Daron Shaw, a government professor at the University of Texas at Austin and co-director of the Texas Tribune/University of Texas Poll, worked on experiments involving yard signs in Perry’s race and saw little evidence that they moved Perry’s numbers. Four years later, Perry’s team essentially abandoned the entire practice of distributing yard signs during his third re-election campaign. He soundly defeated now-former U.S. Sen. Kay Bailey Hutchison in the Republican primary and Democrat Bill White in the general election. Since then, more academic research backed up Shaw’s findings, and yard signs have largely fallen out of vogue within the Texas GOP consultant class, at least among statewide candidates. But that 2006 campaign marked Perry’s fifth statewide race — when he already had near-universal name identification in Texas, much like Cruz does now. As such, Shaw cautions not every campaign should follow Perry’s lead. For a candidate like O’Rourke, who began the race as a relative unknown, there is anecdotal evidence that the signs have helped him build his name identification. Jo Johns is a retired physical education teacher who recently attended an organizing rally for O’Rourke in Weatherford. She told the Tribune she first learned about O’Rourke by seeing his signs while driving to yoga class. Shaw pointed back to the 2014 governor’s race, when Democrat Wendy Davis’ signs outnumbered her opponent, now-Gov. 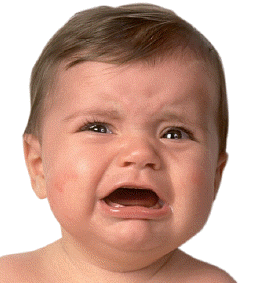 Greg Abbott, in some communities. Davis still lost by 20 points. But this time around, the political scientist suggests O’Rourke’s yard signs are possibly signaling momentum to voters, priming some who may have otherwise assumed Cruz was unbeatable that O’Rourke has a shot. “In this race, it probably is more of a positive because it reinforces information you’re getting in public polls, stories you’re getting in the media and fundraising,” said Shaw. My neighborhood is chock full of Beto signs. Literally, there’s multiple signs on every block. I do a lot of walking through the neighborhood with my dog, and not only are there tons of them, more keep popping up. Meanwhile, I have seen four Ted Cruz signs. Hilariously, three of them are accompanied by green signs with clovers on them that say “Make Beto Irish again”, to which the obvious riposte is “Sure, as soon as we make Ted Canadian again”. Anyway, I think the Trib captures the dynamic of the sign skirmish well. Signs in and of themselves aren’t, well, signs of anything, but this year at least feels different. This year, the vast proliferation of Beto signs are both an indicator of enthusiasm and a means for expressing it. I do think it has helped to expand his name ID, and to signal to Democrats in red areas where they have felt isolated that they are not in fact alone. I don’t think it’s possible to isolate an effect related to this, and if we could it would probably be no more than a marginal one, but I do think this year that signs matter. I look forward to whatever research someone publishes about this after the election.